Ireland is one of the few countries in the western world which does not have a property tax. There are examples of international best practice of fair ways of assessing and collecting property tax, how best to use it to provide essential local services and how to allow for exemptions and waivers. While everyone was delighted when the old local authority rates were abolished, there is no doubt that it was a regressive step. Abolishing rates was an election promise which was shackled to party-political whims for decades regarding local services. There is no doubt that this contributed to the speculators' property boom and planning corruption which has led us into austerity. The problem with the property tax is that it is being introduced at the worst time in our history, during a recession when there are so many burdens on struggling families. Many reputable organisations made alternative suggestions to this tax, including the Commission on Taxation's proposal for a site value tax. Market value is problematic owing to mortgage costs being higher than the value of a home. A site value tax could have been considered to provide for more efficient use of land as well as to raise revenue. It might also have played a role in ensuring we did not have another property boom followed by a bust. A site value tax would have been a better and fairer way of assessing value. Any measure of taxation should be based on ability to pay. The unfortunate fact is that we have the highest number of non-working households - that is, households without a working adult. We also have the highest level of household debt in the OECD. One in five mortgages is in distress and some organisations tell us that more than half of all adults have less than €100 in disposable income per month. The phrase "like taking blood from a stone" comes to mind. Let us consider how this tax is supposedly fair. Supposedly, those who own the most valuable properties will pay most. This aspect is being lauded as one of the measures that will hurt the wealthy. However, it is reckoned that only 1% will be liable for the so-called mansion tax. Those in urban areas will pay significantly more for their houses than those with similar houses in rural areas. Older people with small pensions may be marginally above the income threshold of €15,000, which, I believe, is far too low. It is welcome that there is an exemption for people who, for reasons of old age, physical or mental disability or other causes require special accommodation. I believe the exemption should cover local authority housing tenants and tenants in the non-profit social housing sector. Housing associations are exempt in European countries and such bodies and local authorities should be exempt, as recommended in the Thornhill report, because they are in involved with people in low-income families. In fairness, Dublin City Council has been keeping within budget, but this tax will undermine that. The council cannot impose it on its tenants, who are already struggling to pay their rent and trying to cope with other cuts, including child benefit; the privatisation of waste collection in Dublin Central has also resulted in increased charges, as predicted. Some tenants will come under the special exemption but for other tenants on similar incomes it will not be enough. There are extensive housing needs in Dublin Central. The housing associations are doing tremendous work but imposing this tax on them means certain projects might not go ahead. Clúid Housing Association has striking new plans in Cabra for senior citizens' housing but that might stop and it could affect the budget for maintenance of properties as well. How can the Government expect people in homes affected by pyrite to pay this tax? Their homes are structurally defective and one cannot get a mortgage to buy a house with pyrite. These people who have already paid stamp duty are expected to pay a property tax as well. I notice that the budget for homeless services will be maintained at 2012 rates. However, the homeless services in Dublin maintain they have increasing demands. They cannot do the same amount of work for more people on the same money as last year. Maureen was speaking to Motion, 'I do not believe anyone comes into the political arena to cause hardship and suffering, particularly to those at the lower end of the socio-economic scale or people with disabilities. The optimist in me believes in the essential goodness of people, which is why it is so difficult to understand the rationale behind some of the cuts introduced by the Government. I am not using this occasion to engage in political point scoring or trade insults or derision. However, I must think back to the short time I spent in the previous Dáil when the current Government parties were doing to the then Government what those on this side of the House are now doing to it. I wonder what it adds to confidence in the political system. I know difficult decisions must be made, but what proportionality and fairness lie behind the cuts the Government is introducing? It is creating a more unequal society. The decisions to be made come down to choices. There are always choices, but some of the alternatives receive no airing or recognition. It was very disappointing to hear that organisations such as Social Justice Ireland which wanted to make lengthy submissions only received approximately six minutes to make two proposals. Therefore, there was no real engagement with civil society groups. However, there was real engagement with powerful businesses, lobby groups, interest groups and employers and we see how successful they were. This can remain a low tax country, while broadening the tax base and reforming the tax system to make it fairer. There are taxes on income, but tax receipts can be raised elsewhere, for example, through the 12.5% corporation tax rate. Even a small percentage increase in that rate and a modest financial transaction tax would have taken the vicious sting out of the budget and the harsh, pitiless decisions to cut the respite care grant, child benefit and other allowances to the needy would not have been required. There are alarming figures for what is being lost to Ireland and other countries in the developed and developing world because of transfer pricing and we are allowing the country be a tax haven. I have no doubt that people were very generous when the Society of St. Vincent de Paul held a collection in every parish throughout Dublin last weekend. Some weeks ago I visited the Capuchin day centre in Smithfield where the effects on their services of the recession and Government cutbacks are very visible. These two organisations have in common that they are now seeing people who had never previously availed of their services. The challenges they and other organisations, such as Simon and Focus Ireland, are facing are great. They do fantastic work, but in a truly civilised and humane society the State would look after the poor and marginalised in a meaningful and adequate way. Instead, the Government is introducing measures that will only increase the demand for these organisations' services. This is why equality-proofing of budgets is vital. An effective social impact analysis of each spending measure and reduction should be undertaken as a matter of course. This would give an accurate indication of the proportionality of impact on the better-off, who we are repeatedly told are bearing their fair share. The fact that this budget imposes greater hardship on certain groups makes it very unfair and regressive. The Minister, Deputy Joan Burton, emphasised that social welfare rates have been maintained, but people must now do more with those payments. The reductions in child benefit will take immediate effect, but there is no information on when measures to offset those reductions for the disadvantaged will be introduced or what form they will take. A family of four will lose €58 per month as a consequence of this budgetary measure. While some will be able to absorb that reduction, it will be a massive loss for others. People with disabilities, whether mental, physical or both, and their carers have enough stresses in their lives and must support a higher cost of living, yet they are being subjected to a reduction of 20% in the respite care grant. There is no recognition that carers save the State money. If every carer in the country were to refuse to look after their family members, which, of course, they would never do, we would soon see the massive sums of money involved. At the same time, €55 million was found for the bloodstock industry. I would not mind so much if this allocation included a social responsibility levy for people with a gambling addiction, but there is no such conditionality attached. Meanwhile, the back to education initiative has done great work in Dublin Central in offering people a second chance, but provision under that scheme is also reduced. On the increased powers for recovering overpayments, it is clear that nobody supports fraud. However, a weekly payment must not be allowed to fall below what is appropriate and necessary for a basic standard of living. In this regard, the deduction ceiling of up to €28 per week seems very high. I hope we will see the same zeal and rigour in pursuit of those who have engaged in tax fraud at corporate level. The north inner city training centre is a special place which offers great opportunities for training and education. There must be positive discrimination for lone parents, of whom we have a higher number than the national average. Everything that we predicted would happen has happened in terms of Dublin City Council's decision to privatise waste collection in its area. We are seeing the introduction of new charges. This experience should be borne in mind when considering any similar privatisation initiative. I conclude by pointing out that yesterday was World Human Rights Day. There is little evidence in this budget of any respect for the human rights of people on low to middle incomes, the unemployed, senior citizens and persons with disabilities. 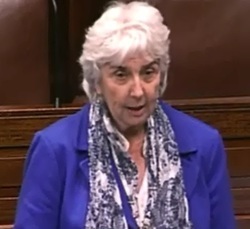 Maureen O'Sullivan asked the Minister for Justice and Equality if his attention has been drawn to the disparities between the Inspector of Prisons' report on St. Patrick's Institution, Dublin and the Visiting Committee Report of 2010; the location at which it is planned to accommodate 18 to 21 year olds, who would currently be residing in St. Patrick's Institution (detail supplied), after 2014; and if he will make a statement on the matter. Deputy Alan Shatter:The Deputy will know that for many years I expressed concerns about St. Patrick's Institution and believed it was an inappropriate facility for children. I was instrumental in ensuring that the programme for Government included a specific commitment to end the practice of sending children there. I visited St. Patrick's within two weeks of my appointment and I met the Inspector of Prisons at his request in early May last to discuss the matter with him. I published the St. Patrick's visiting committee report for 2010 on 18 November 2011. As stated in its report for that year, the committee had met monthly and carried out some 48 random unannounced visits during the year. In that context, it reported on a number of issues and developments generally within the prison relating to accommodation, kitchen and gymnasium facilities, staffing, education, the library, workshops and facilities generally. The inspector's report, which I published last October, raised serious issues and major concerns, including weak management, the behaviour of some prison staff, the culture in the prison, the inattention to human rights norms, prisoners on protection and the prevalence of drugs. The inspector concluded that there has been a culture in St Patrick's which resulted in the human rights of some prisoners - children and young adults - being either ignored or violated. The inspector also reported that the visiting committee appears to be carrying out its mandate under the relevant legislation and that its chairman had raised a number of issues with him. An action plan is now in place implementing all of the inspector's recommendations, with more than 80% of the recommendations having been implemented to date. I have yet to publish the visiting committee's annual report for 2011. In light of the inspector's report, I asked if the committee would consider the issues raised by the inspector and whether it would wish to comment on its contents in the context of its report for 2011. I will publish its report when I receive its response. As the Deputy is aware, the Government committed in the programme for Government to ending the practice of sending children to St. Patrick's Institution. The practice of sending 16-year-old boys to St. Patrick’s ceased on 1 May 2012. From that date, all newly remanded or sentenced 16 year olds have been detained in the child detention facilities at Oberstown, Lusk, County Dublin. The detention of children at St. Patrick’s Institution will end with the provision of more appropriate accommodation and regimes in the new detention facility at Oberstown by mid-2014. Last week, the Government allocated €20.4 million in capital funding for 2013 to the Department of Children and Youth Affairs to enable this project to proceed. In the interim, the Irish Prison Service is devising a specific strategy for the management of young offenders, working with its partners and other agencies to ensure that the regime for young offenders is age-appropriate and that best practice is observed. Central to this strategy is enhanced co-operation with the Irish Youth Justice Service, including the placement of a number of care staff from the child detention school to work alongside prison staff in St Patrick's. It is intended that this will take place in mid-January 2013. In addition, the feasibility of accommodating some categories of the 17-year-old age group in the child detention schools before mid-2014 is being actively examined. As part of this strategy, the prison service will also review the overall approach taken to the placement of 18 to 21 year olds, in line with my intention to introduce primary legislation for the purpose of closing St. Patrick's Institution as a detention centre for persons aged 21 and under. Deputy Maureen O'Sullivan: The positive message from the Minister's reply is that he acknowledges what other reports, including the Whitaker report and the reports of the Ombudsman for Children, prison chaplains and the Jesuit Centre for Faith and Justice, have highlighted since 1985, namely, that there is an appalling breach of the human rights of young people in St. Patrick's. What is the long-term plan to provide for those under the age of 21 there, of whom there are currently approximately 160, including 14 who are young women? International best practice indicates that those under 21 should not be detained in the same prisons as adults. The need for the immediate publication of reports has been highlighted and there should be no delay in their publication. That is my first point - that reports should be published in a timely way. My other question is whether the reports will go directly to the Oireachtas. There is an acknowledgement of wrongdoing on the part of the personnel in St. Patrick's, but there are also questions to be answered by the Department of Justice and Equality and the Irish Prison Service. Deputy Alan Shatter: It is my intention to introduce legislation, which is also referenced in the programme for Government, under which the visiting committee reports will be submitted directly to the Inspector of Prisons, and if members of visiting committees have concerns about any institution they visit during a year they will have direct contact with the Inspector of Prisons. Under the new legislation, it will be the inspector who publishes the visiting committee reports and engages in any follow-up that may be necessary. A review group is currently reviewing prison policy issues. As the Deputy will be aware, the construction of a new wing of the Midlands Prison is being completed and there are plans to build a new prison in Cork. When the new wing of the Midlands Prison is open and the new facility is constructed in Oberstown, I intend to take steps to bring about further reform in respect of the 18 to 21 year olds at St. Patrick's Institution, how they are dealt with and where they will be located. There is an issue as to whether we should be locating all 18 to 21 year olds in one facility. I have concerns about the need for additional facilities for young people who are in prison in order that we do the maximum possible to encourage them to desist from reoffending when released from prison. We have made enormous strides in the past 18 months in this area. It is very much a work in progress. Issues have been neglected for many years and they cannot all be addressed in 18 to 20 months, but we are making enormous progress. I believe that by the time the Government has completed its term we will have an entirely different prison policy and a different approach to dealing with young people who have to serve sentences. Deputy Maureen O'Sullivan: I represent Dublin Central and we know about the revolving door syndrome and the incidence of repeat offences. We should be all on the same wavelength in encouraging rehabilitation and ensuring conditions in prison facilitate it rather than hinder it. Will the Minister engage with those civil society organisations who are involved in the prison and speak with former prisoners to get their views on this? The Minister mentioned the establishment of a comprehensive complaints system and I believe he suggested 2015 in that context, but in the meantime, we do not want to lose the generation of young people who are in St. Patrick's. Deputy Alan Shatter:New arrangements have already been established with regard to a complaints system. On the question of meeting former prisoners, in the preparation of his report on St. Patrick's Institution, the Inspector of Prisons not only visited the prison at various unexpected times of the day and night, including at weekends, but went to the trouble of meeting former prisoners from St. Patrick's Institution. The important and detailed report he produced was the result of 14 to 16 months of focused work and engagement by him. We should be grateful to him for the important work he has done. We rapidly set up an action plan to ensure that all issues addressed by him and all the recommendations made by him would be fully implemented, and that is the road we are travelling. I propose to share time with Deputy Joan Collins and Deputy Tom Fleming. I listened to the tones of assurance and confidence with which Ministers spoke yesterday and the conviction that the decisions they were making were the right ones and the positive language, such as "success", "growing and developing economy", "well on the road to recovery" and "protecting the most vulnerable to the greatest extent possible". There was a disconnect between hearing that and the reality on the ground. I left the House at 5.30 p.m. to attend two community meetings in Dublin Central. I looked at the reality from the point of view of those groups. A number of the people involved were senior citizens. While the primary weekly rate for older people is maintained at current levels, such people will have to pay more out of the amount because of the reduction in the household benefits package. People were delighted the free travel scheme was kept but they were particularly mad about the trebling of prescription charges. Low-income groups and the unemployed are disproportionately affected by the budget. I think of families struggling in communities across Dublin Central who see few, if any, real benefits to them. Instead, they must contribute more and, at the same time, the quality of services in health, social protection and justice are further stretched. The reduction in child benefit is particularly hard because it is not fair. It targets everyone the same, regardless of their circumstances. The sum of €10 will hit the less well off much harder than those on high incomes. I acknowledge the effort to offset this by the provision of child care supports for lower income families and disadvantaged communities, but the sum of €10 is gone immediately and the supports may take a while and involve bureaucracy before they materialise. This time last year we heard about the Scandinavian early school model but we are still waiting to see it in action. With regard to corporation tax, no one wants to drive multinationals out of the country but we want multinational companies making billions in profits to pay their fair share of tax. If we are interested in transparency and accountability, we will show exactly how much corporation tax is paid. The Chairman of the Committee of Public Accounts is just back from Africa where he investigated corruption and possible fraud. The Committee of Public Accounts in Westminster called in multinationals to meetings in Westminster to examine the billions of pounds of profits and systematic underpayment of taxes. Our Committee of Public Accounts is more concerned with ensuring money going to Uganda and Mozambique is monitored and accounted for. That is all very well because no one wants to see the money being wasted. However, what about what is happening in our country? We are not getting the full 12.5% which, if collected in full, would more than cover the €10 being taken from child benefit. Yesterday, the European Commission presented a package to fight tax evasion and aggressive tax avoidance by multinationals. It estimates that European countries lose €1 trillion in much-needed revenue every year. Our tax revenue cannot be used to reduce the overall tax bill of transnational businesses. Apart from ethical considerations, there are economic benefits to Ireland. Even a modest financial transaction tax would bring in much-needed revenue. Despite submissions from reputable organisations and a report by the Commission on Taxation in 2009, the site value tax was not considered. If the recommendations in the Kenny report of 1973 had been adopted, we might have been spared the reckless planning and crazy rezoning that took place when landowners and property speculators made huge profits. We must stop the possibility of another property bubble and a site value tax would have gone a long way towards preventing it. It would also have been a fairer way of assessing value and reducing dereliction. The Minister mentioned seeking targeted incentives in already identified regeneration areas. Three such areas exist in Dublin Central: O'Devaney Gardens, Dominick Street and Croke Villas. Regeneration is not just about houses but also facilities and services. We should have a draft budget some months before in order that we can have a real debate. There should be equality proofing in order that there is social impact analysis alongside each spending measure or reduction. We need specific policy measures on women and children with disabilities and young people. At the heart of every budget should be the principle of not increasing inequality. A social impact analysis would show what taxes on the wealthy would introduce. Alcohol and tobacco are costing enormous amounts in the health budget so it is very disappointing that nothing was done on minimum pricing of alcohol or a social responsibility levy on alcohol sales and betting transactions. The building of youth facilities will take people out of St. Patrick's Institution. Where are the resources to ensure they do not end up in those places? We note the proposed changes and the increase in the numbers of people on community employment schemes, but some of the programmes are unlikely to attract those who most need them, namely, lone parents. The number of lone parents in Dublin Central is far above the national average. Community employment has been very progressive in moving people into second chance education and training. I welcome the development aid budget and the mental health budget and while the sum of €35 million is ring-fenced, we need to see movement on it if it is to be spent where it is intended to be used. As the Independent speaker at the Constitutional Convention last Saturday one of the points I made was that when the eight topics have been dealt with that there is a need to examine human rights. I specifically mentioned people with disabilities, both mental and physical. I also made a point about the rights of prisoners because their mental health has been very much neglected. This has not been a good year for people with disabilities, both mental and physical, because added to the obvious difficulties of living with a disability and the stress and strain of coping with that both for the person affected and their loved ones, there are also the additional stresses and strains caused by insensitive and unethical measures for personal assistant hours and home help hours. Those measures are also uneconomic because various organisations have made calculations on the cost of keeping someone in hospital or a nursing home. The cost of providing supports for people with disabilities in order that they can be cared for at home, in so far as that is practicable, is minimal in comparison. There are varying degrees of disability, both physical and mental, and some require 24-hour care, but the general agreement is for community care in so far as that is possible. I know the Minister of State, Deputy Kathleen Lynch, agrees with that. Allied to that is the absolute necessity of respite for the family members doing the caring. People with significant disabilities need more services in order to live independently. The philosophy of independent living is that every person is important and has the right to live a fulfilling life. The role of the personal assistant is vital to that. Cutting personal assistant and home help hours will be much more costly in the long run, in addition to the awful effect on the person with a disability whose quality of life is being affected. In terms of mental health, we are aware of the disproportion between the number of people with mental health issues and the financial allocation to services in this area. Due to previous speaker working into my time, I didn't get to say the following on the private members' motion on Disability. . .
'I acknowledge the role of Mental Health Reform in their work to improve mental health services and to progress relevant measures both 'A Vision for Change' and the government commitments in the Programme for Government. Generally everyone is saying the same but the difficulties arise with the implementation. I support the reform group's slogan - 'Don't Drop the Ball on Mental Health@. We know the continuing recession has put further strain on the mental health of the country so there is more of a need to ensure the necessary services are available. There are concerns around the ring-fenced 35 million - will it be used to prioritise intellectual disability, old age and forensic psychiatry, alongside the further development of community mental health teams. This seems to have disappeared from the agenda. I hope it gets the prominence it deserves in the Budget. A few other points in the mental health area - I support the call to take the word 'lunatic' out of Irish law. There is a dire need to reform the 1871 Lunacy Act and bring the Mental Capacity Bill forward. There is a need for the independent inspection of Intellectual Disability services. The needs of young adults with an Intellectual Disability when they leave school have to be addressed and the issue of long term patients in unsuitable premises has to be sorted.